What a joyous time! Happy New Year! Each new year brings new opportunities to grow into becoming a better person. What is God calling you do to this year? 1) Commit to daily Prayer + Mass: I invite you to spend more time with Christ in the chapel. There is no better way that to tell Jesus what is going on with your life, what you are thankful for and how you want to grow. Mass is “the source and summit of your Faith.” (CCC 1324) Don’t have time? Make God time and He will give you time. 2) Speaking about Mass and Summit 2019- The Lord desires to reach a high point with you and bring you on a journey to Heaven! Want to experience going to Mass with over 800 college students? VA CCM Summit 2019 is in Richmond, VA will take place from February 8-9!! Please sign up today! https://www.vaccmsummit.com/ Last day to register is tomorrow, February 4. It’s only $35 for talks, free t-shirt, hotel and food including Chick-fil-A! Our Campus ministry brought 54 students last year and we plan to bring more this year! We would love for you to come! Have a great week everyone! The flu is going around campus and the center, so make sure to rest well, drink lots of water, and avoid the center or classes if you are showing any signs or symptoms. Thank you so much for your cooperation and we pray for your health and wellness, so you can enjoy your classes and Summit this weekend! I praise You and give You thanks with all my heart for the favors You have bestowed on me. Your Goodness has brought me safely to the beginning of this day. Behold, O Lord, I offer You my whole being and in particular all my thoughts, words and actions, together with such crosses and contradictions as I may meet with in the course of this day. Give them, O Lord, Your blessing; may Your divine Love animate them and may they tend to the greater honor and glory of Your Sovereign Majesty. Amen. Looking for a way to grow more in the faith while fostering relationships and enjoying tasty, home-cooked meals? Come on down to Supper Social, held every Thursday at the UMW CCM. 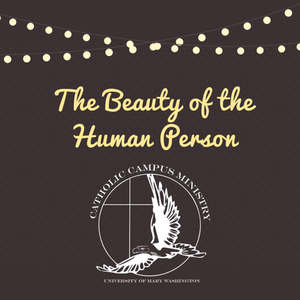 This Thursday, Feb. 7th, Supper Social will feature a talk on Humanae Vitae, from Mr. and Mrs. Bereit, well-known national speakers and truly cherished members of the Catholic community! We will also be enjoying a Chipotle-style dinner cooked by Rocio Atkinson and Nancy Wade! Next week, on Feb. 14th, we will have a Q&A talk on Catholic Myths and Confusions about Catholicism by our very own Father Vaccaro, along with a delicious meal. We look forward to welcoming you to these events! Our second Fun Friday of the semester is officially in the books! Thank you to everyone who came out to make the event such a huge success. We watched Ant Man and the Wasp, played video games, had snacks, and enjoyed a lot of relaxing time with friends! There will not be a Fun Friday this week since we are attending Summit instead. Our next Fun Friday will be a trip to see Father referee a basketball game followed by a tasty dinner at Metro 29 Diner on February 15th. Mark your calendars and I hope to see everyone there! There was no Sunday Talk last week, due to the Super Bowl. We will resume next Sunday, February 10th at 7:30 pm in Lee Hall Room 411 with a discussion of The Fall of Man and the Rise of Shame. Join us after the Talk for our weekly McDonald’s excursion! If it’s your first trip to McDonald’s with CCM, Father Vaccaro will treat! All are welcome so bring your friends!